This album is one of the most quality albums to ever drop. A rap sheet worth of quality guest appearances. If you haven't heard this yet, you should. This album is exceptional! 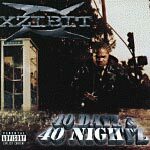 Executive produced by Xzibit. Guest appearances by Tha Liks, Saafir, Ras Kass, Jayo Felony, Method Man, and King T.